Nokia’s strategy to “connect the next billion” is slowly but surely coming to fruition with the inclusion of the media-centric X2-02 handset in their wide device portfolio. 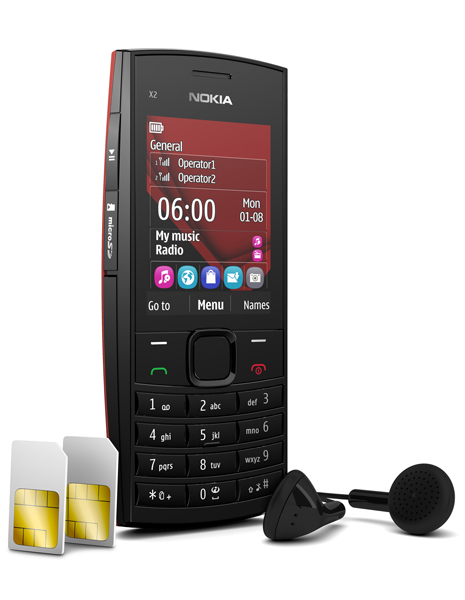 It comes with Nokia’s very own Easy Swap Dual SIM technology and is loaded with dedicated Facebook and Twitter clients that you can directly launch from the home-screen shortcutbar. For those interested, you can select your phone from 5 vibrant and exciting colours: Bright Red, Dark Silver, Orange, Violet and Ocean Blue. On top of all these cool features, this looker comes at an affordable price of € 60 before applicable taxes and subsidies, though this price may vary in different markets. So are you getting one? Btw, I thought the X series naming convention has been replaced with Asha? Perhaps this phone was in the works before the announcement of the Asha series. Please correct me if I am wrong. Thanks Vikas Patidar and uturn for the tip!